As the name suggested, It’s a Rhythm-Based game. But not an usual Rhythm-Based game. For anyone who’ve played any game in the series will know how this one is different from the other. If you don’t, You’re not going to press a button shown on screen to beat in this game. 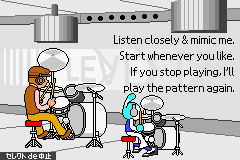 Instead you’ll have to play various minigames using the Rhythm you hear to move on! I’m saying this because a majority of times your screen will be corrupted so you can’t see. And if you good enough, You don’t even need to see the screen to play it. Just listening the Rhythm! 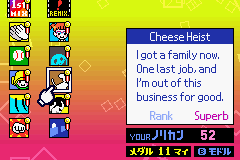 Sure, You can get Rhythm Heaven Megamix (Called Rhythm Tengoku: The Best+ in Japan) to play most (if not, all) of minigames appeared in this one. But it’s probably worth to try this one. Because this is where the series started it all. 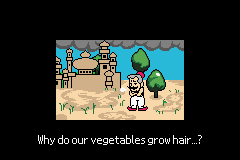 On a side note, You might get a few WarioWare vibe in this game due to the fact that they reused GBA WarioWare game engine for this. 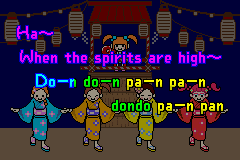 Rhythm Tengoku is a quirky rhythm game for the GBA. It came out in Japan in 2006, but never made it anywhere else. 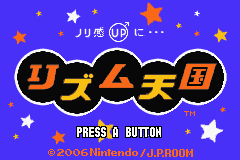 Its 2 sequels (Rhythm Heaven and Rhythm Heaven Fever) have been translated and released overseas, but Tengoku never was. This release, Beta 10a, is a complete text translation. This also has a great deal of graphics translated (at least 80%), and maybe some bugfixes that weren’t in the previous release.